The expression Pot-Bouille, the title of one of Zola’s Rougon-Macquart series of novels, is difficult to render in English. “Pot luck” in the Midwest, where I come from, implies taking your chance on what may be in the pot that day. A French dictionary calls pot-bouille a “repas ordinaire d’un ménage.” I rather like that – it’s what you usually get, and luck doesn’t much enter into it. They [the maids] all plunged back into their kitchens; and from the dark bowels of the narrow courtyard only the stench of the drains came up, like the smell of the hidden filth of the various families, stirred up by the servants’ rancor. This was the sewer of the house, draining off the house’s shames, while the masters lounged about in their slippers and the front staircase displayed all its solemn majesty amid the stuffy silence of the hot-air stove. Now that I have read several Zola’s novels, I am struck by his repeated use of human constructions as metaphors for the theme of his story. In Pot-Bouille, it is the apartment house, designed to be impressive, but concealing its decadence. In La Curée, it is the grand, over-decorated mansion constructed by Saccard to display his wealth and social importance. In Germinal, it is the mine and its machinery – underground, yet dominating all above and below. In The Belly of Paris, it is the market, which is large, complex and contains the delights of fresh foods along with the stink of garbage. In his biography, Zola: A Life, Frederick Brown gives a detailed account of how Zola acquired a modest country property at Medan. As he prospered, he expanded the original house, remodeling it and adding wings and towers. Construction had meaning to Zola, as shown by the attention he paid to his own property and his evident pride in the results. His house was a testimony to his success. With his feeling about the importance of buildings, it is appropriate that an apartment building in Bot-Bouille links together the characters and subplots of the novel. For example, it represented the conventional virtues to the erring Berthe, hiding from her angry husband. Then gradually the solemn staircase filled her with fresh anguish; it was so black, so austere. No one could see her; and yet she was overcome with confusion at sitting there in her chemise amid such respectable gilt and stucco. The wide mahogany doors, the conjugal dignity of these hearths, seemed to load her with reproaches. Never had the house appeared to her so saturated with purity and virtue. Berthe is wrong, of course. The house itself cannot be virtuous, only the people within. Zola notices the details of wide mahogany doors and grants conjugal dignity to hearths. He is sensitive to constructions and what they represent. I hope he was satisfied by what his own domestic constructions meant to him, as well as what they represented to the world. 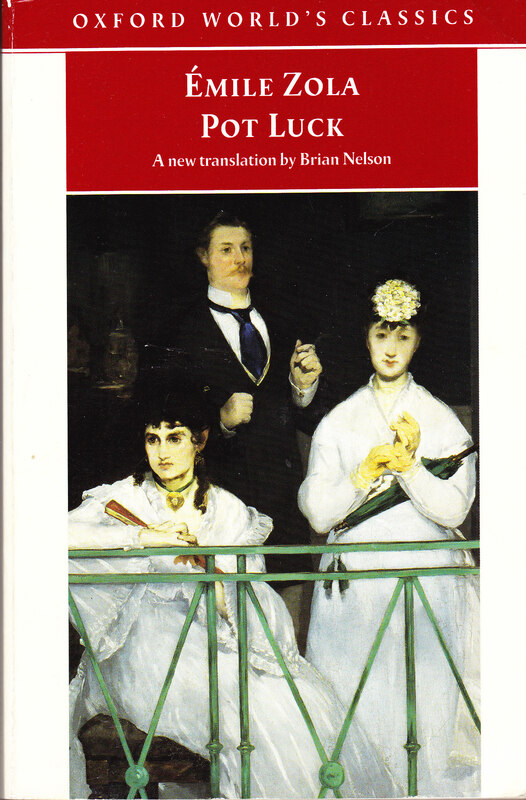 This entry was posted in 1882, Émile Zola, Commentary, English, Nancy (Silver Season), Nelson, Brian and tagged Émile Zola, Brian Nelson, Pot Luck, Pot-Bouille, Rougon-Macquart. I have never thought of ‘human constructions’ as metaphors before but now that you mention it is does make sense. I think I’d say that these constructions or places become a character in the novels. This is especially the case with trains in ‘La Bete Humaine’ and Paradou in ‘Sin of Fr Mouret’ as well as those you mentioned. I haven’t read those two yet, but will get to them eventually. I am currently reading Thomas Hardy (Return of the Native) and the contrast is startling. Hardy relates his characters in the natural landscape and its associations with ancient times. This is not something the characters created and they must make their way within it. In Zola, with all his interest in heredity and environment, the environment turns out to be mostly man-made, what I call “a construction,” made as an expression of the relationship of those characters to the larger world.